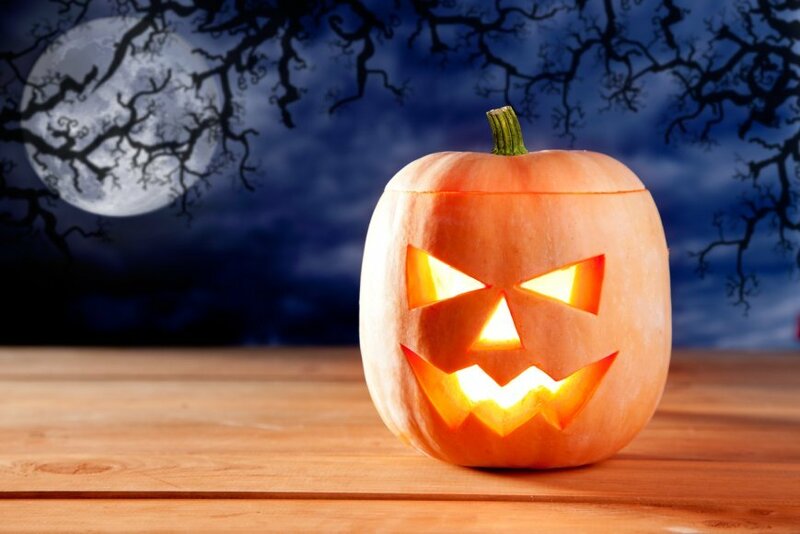 If it was Tuesday Oct 31st I would be inclined to describe it as being eerily quiet in here, but it's not Halloween yet. 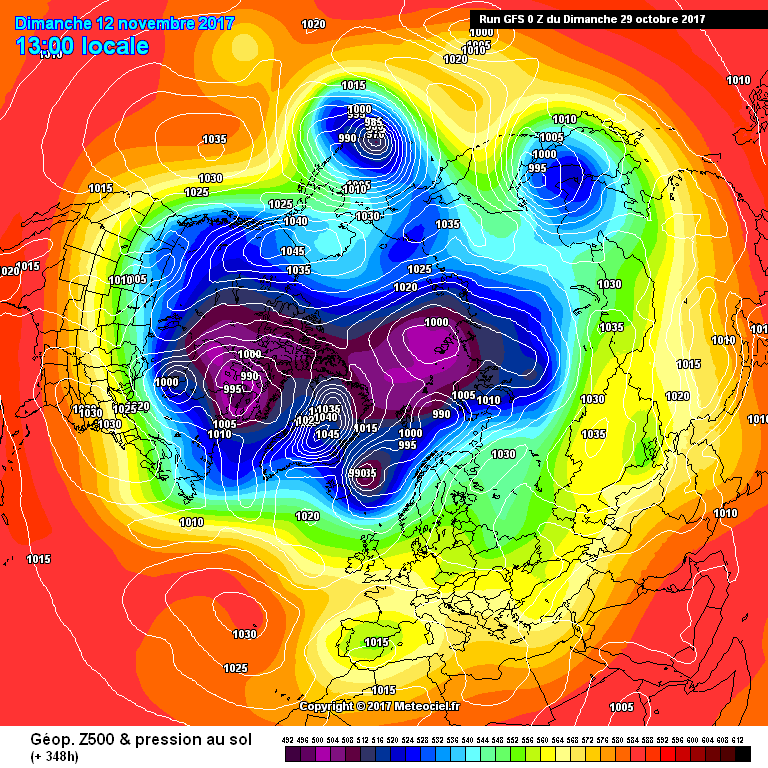 Only logical explanation I can come up with for this is more than likely the latest Ecm12z. One blink and you'll miss it pm shot/incursion for around the 4th is all this update seems to offer. 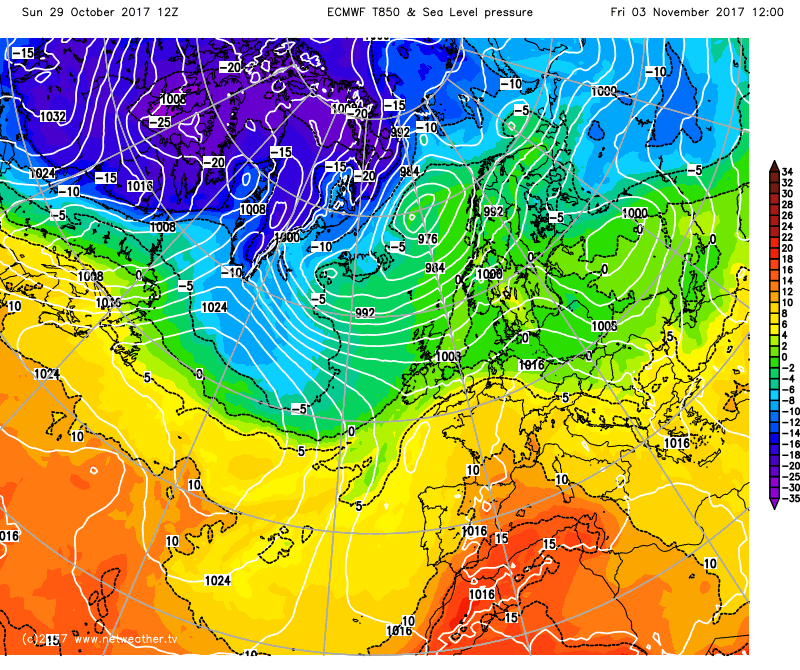 As much as there are some disrupting troughs and blocking to the NE to wonder about, the past few GFS runs would each place UK temps as a whole very close to average as of mid-month, and this doesn't even hide all that much variability within those two weeks; just chilly, then quite mild, then chilly, etc. So nothing obviously exciting on the offering and the lack of any strong storms tracking across our lands is noteworthy. 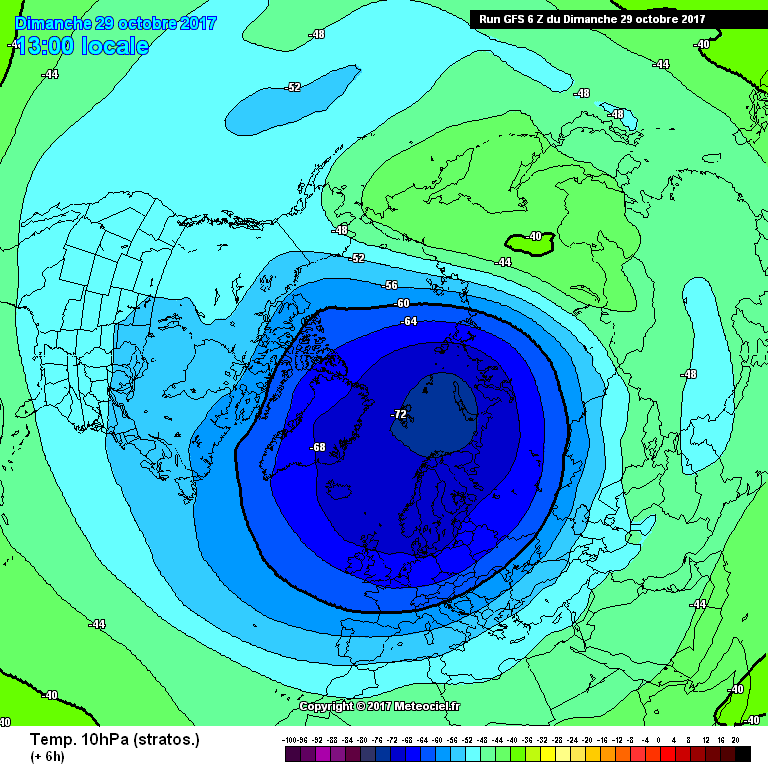 Vortex looking compact but rather weak to our NW (i.e. 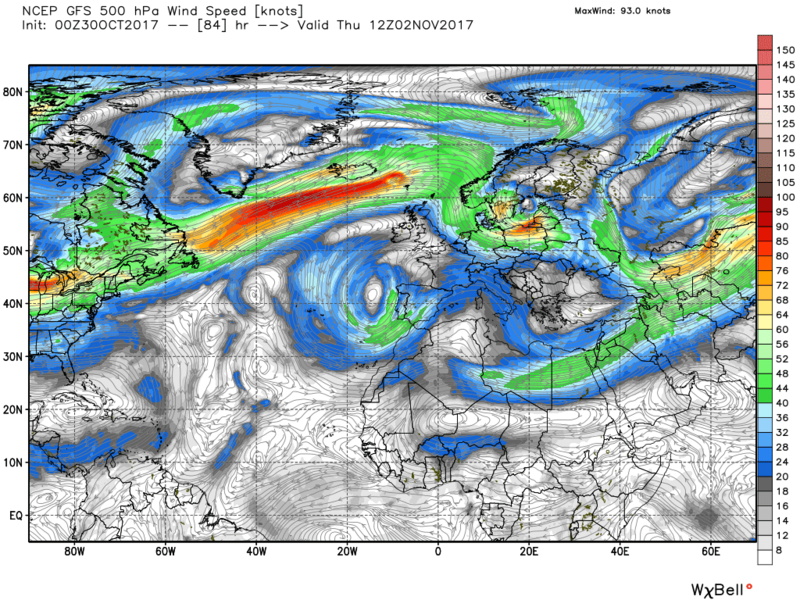 not very extensive) hence the exploration of trough disruption by some runs, interchanging with the most probable alternative that his an extension of subtropical ridging right across the UK, producing the aforementioned benign run of weather. Oh well - at least we'll have plenty of energy left for the real chases in the actual winter months! 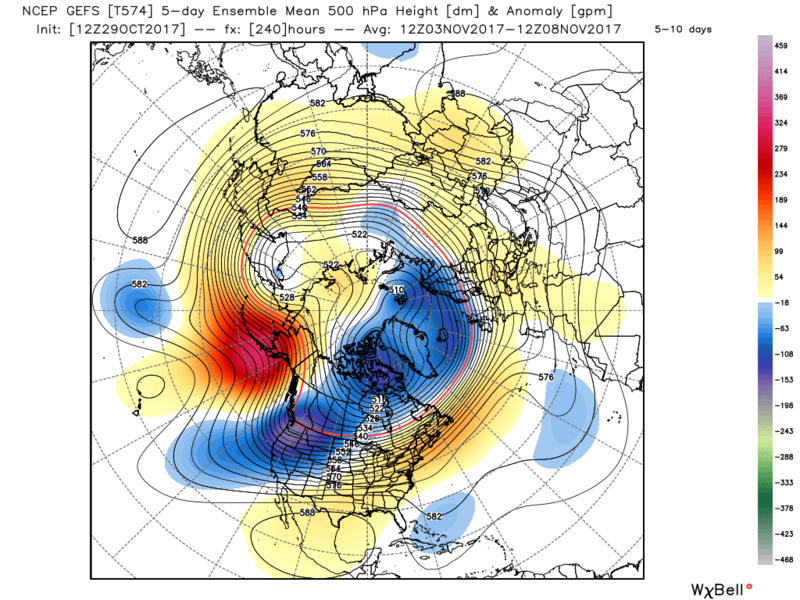 A pretty fair agreement between last night's NOAA, GEFS and EPS anomalies in the ten day range. 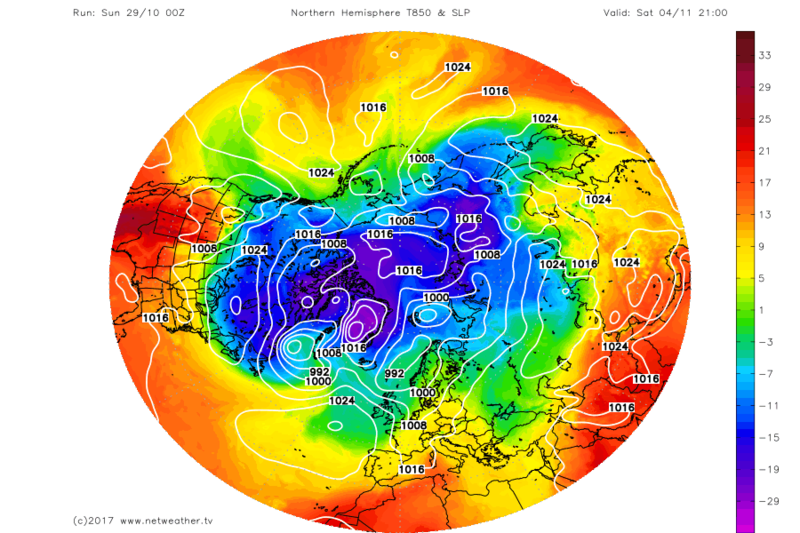 The key features upstream being the Aleutian ridge, an active vortex lobe northern Canada with associated positively tilted trough across N. America and low pressure Greenland/Iceland area. 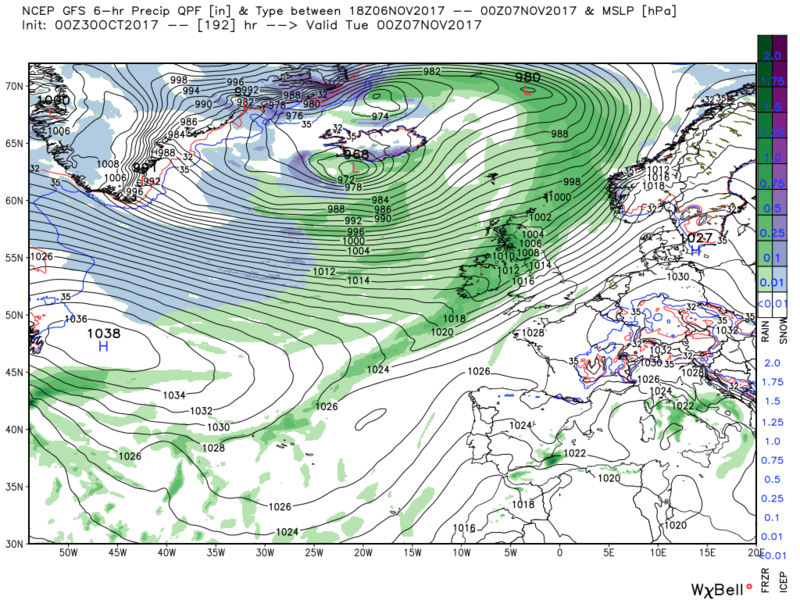 Thus a strong upper westerly flow across the US and into the Atlantic which will abate somewhat in the east and to some extent diverge with a slack area of low pressure to the south and east of the UK. So the weather remaining changeable with a N/S bias initially but less so at the end with the trough to the NW taking closer order. Temps varying around the average but perhaps trending below by the end of the period. Meanwhile back to the present. Currently there is a weak front lying across the southern half of the UK which should clear to the south but cloudy with patchy drizzle in Wales, south Midlands and the south west until it does so but then fine. Elsewhere cooler and brighter down the east coast with some showers with the wind abating (good news in the North Sea where it is violent storm 11 in some areas). 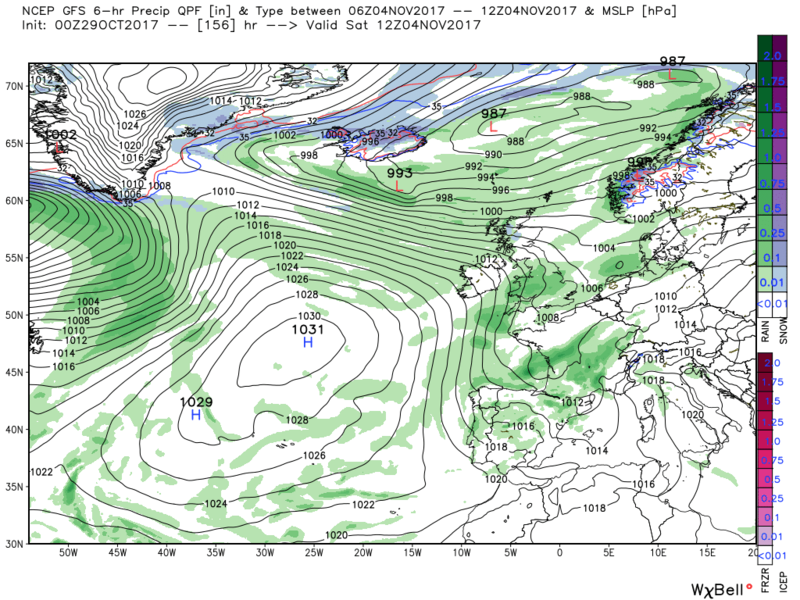 For the north west, N. Ireland and Scotland the best of the weather as the high pressure moves in. 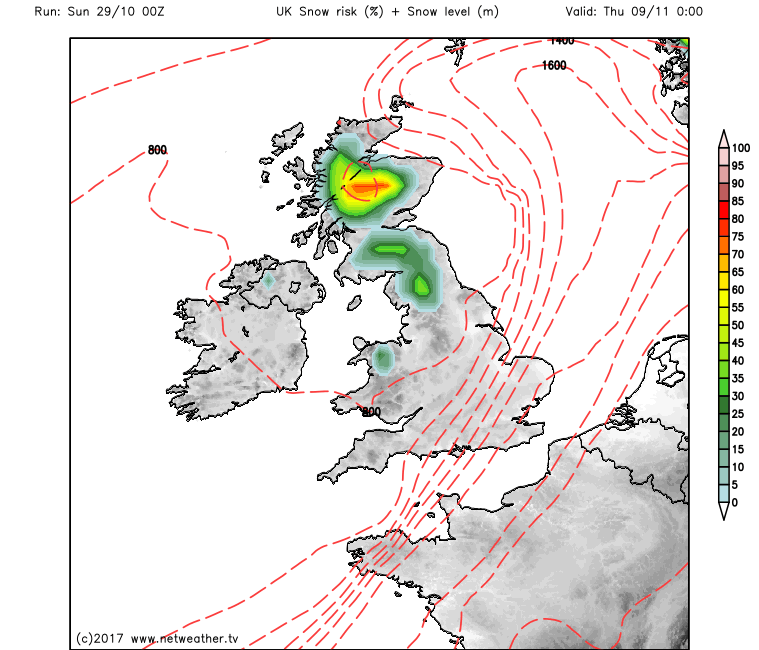 The result of that is that by tonight the whole of the UK is under it's influence leading to a widespread frost tomorrow morning. 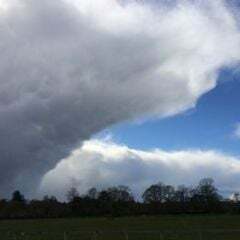 Thus a fine day tomorrow bur fronts and patchy rain will encroach from the north west during the day progressively affecting the north and west. By midday Wednesday we have the not unfamiliar patter of high pressure surging north in a mid Atlantic, with a cut off low to the south west and energy/troughs winging west-east in the north.on the strong thermal gradient before dipping south east into eastern Europe. 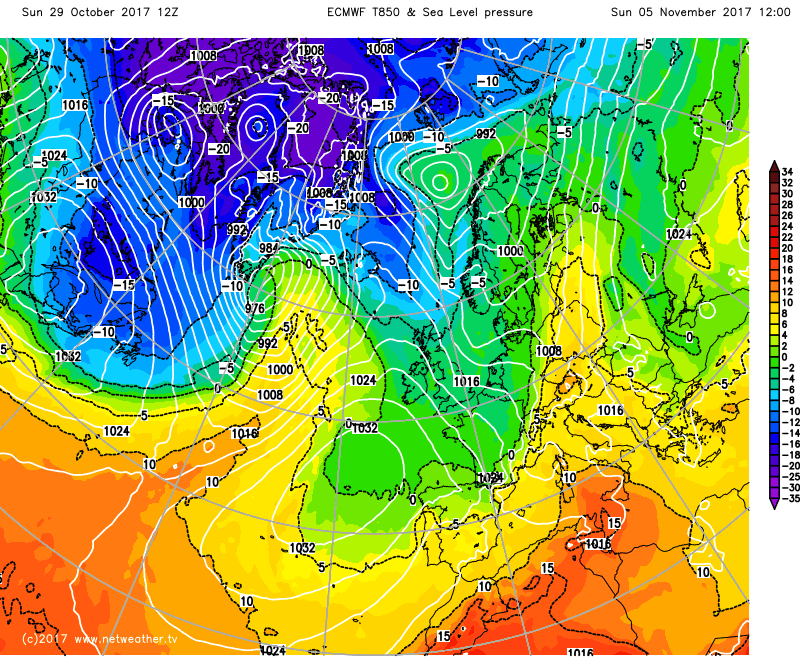 Over the next couple of days the UK manages to remain in a slack gradient/col regime as it comes under pressure from both the north west and south west. 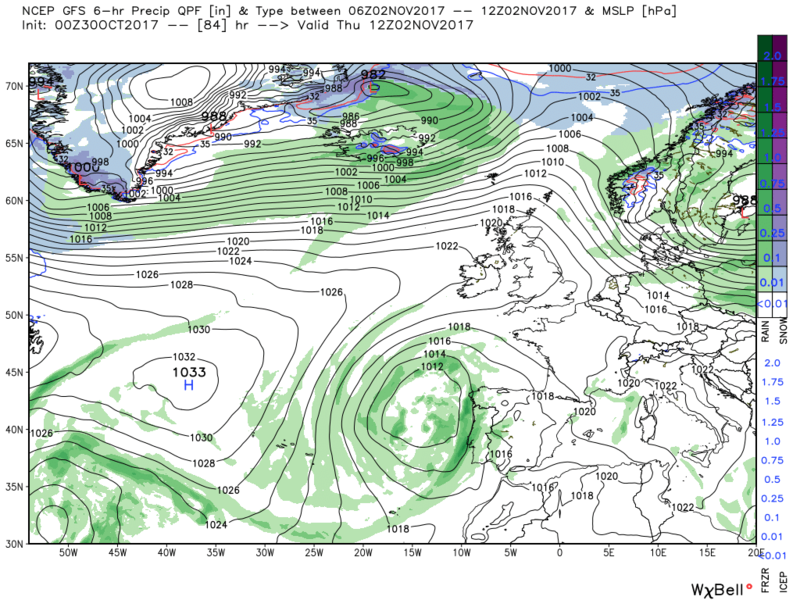 This pressure has a minor victory on Saturday with some patchy rain over much of Britain followed by some transient ridging on Sunday before the Atlantic gets into gear with fronts traversing the country on Tuesday, pretty much as indicated by the anomalies. 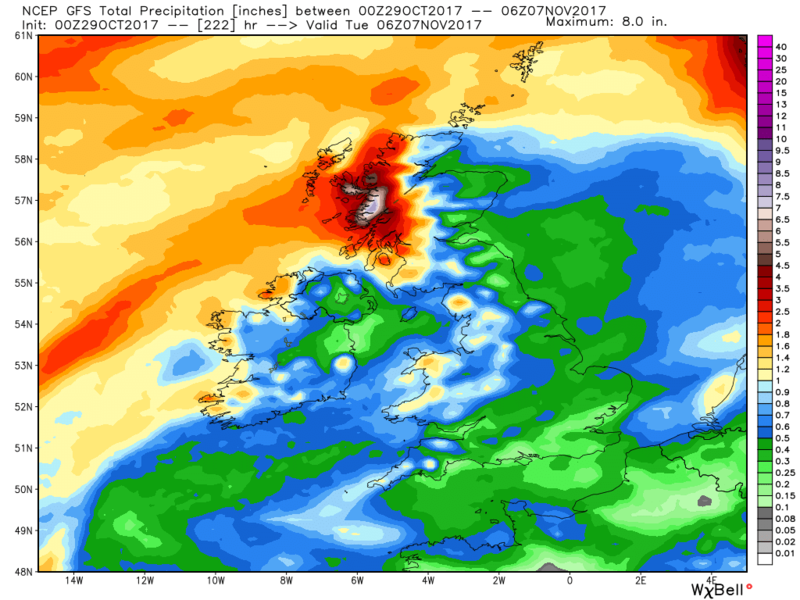 Throughout all of this temps vary around the average and much of the UK remains pretty dry with the usual hotspot in western Scotland.And not very windy apart from Scotland at times. 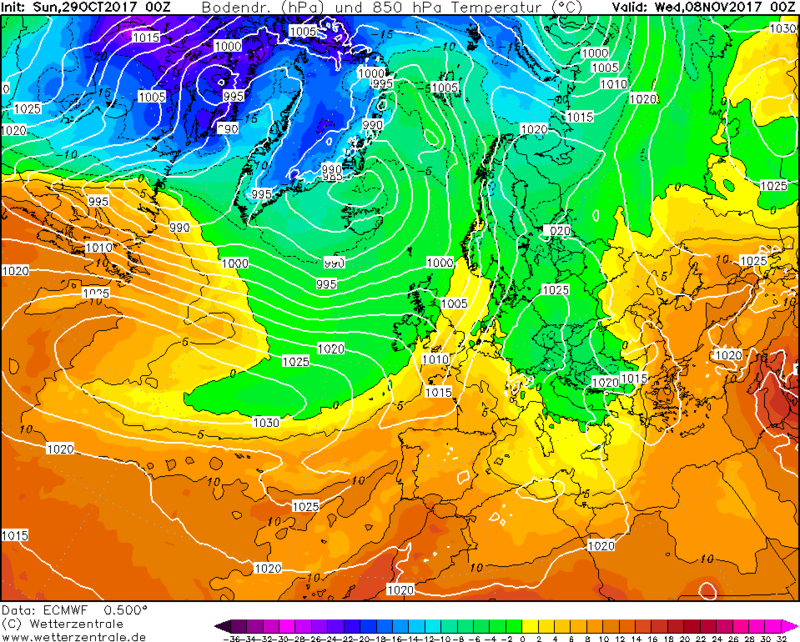 Well for those like myself who were wanting a cold foggy/frosty November its all going a bit meh. 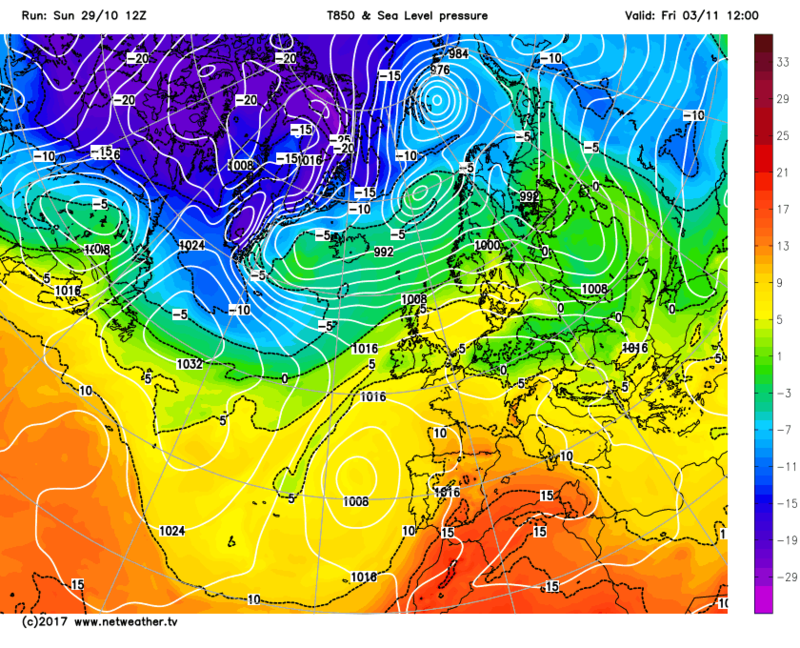 All looks very zonal with our friend the Atlantic going up a gear or two. Nothings changed since early June - no sign of the Atlantic quietening down, a little bit more ridging/amplification going on but only temporary 'blips' - trying to remember the last time we had a spell of easterlies or an area of high pressure over the country. I wouldn't say Zonal, More a cooler N/Wly Pm flow. only briefly, then back to quiet again. 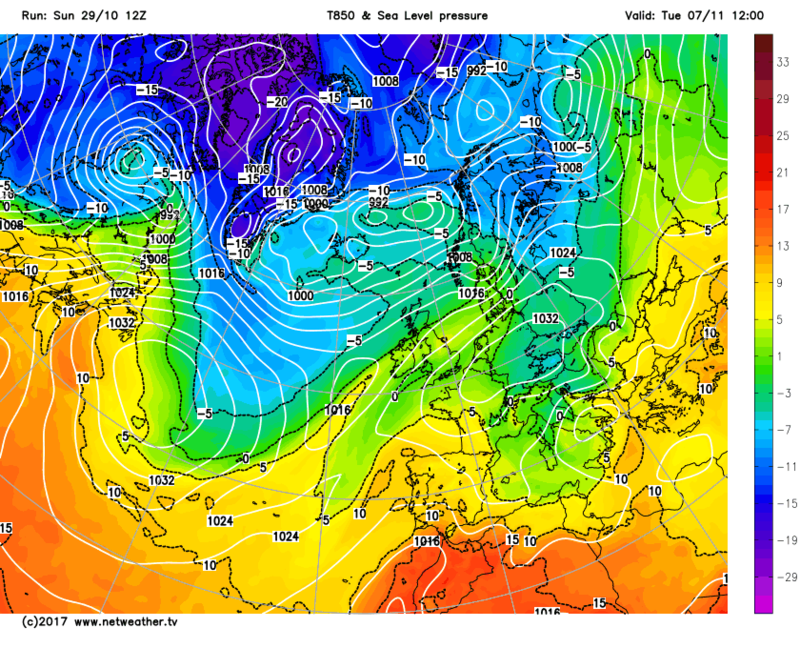 anyway, its colder air when we do get more unsettled and we want that to get into europe to build a cold pool. to be fair, zonal is pretty normal in november. the vortex strengthening is normal and expected. its whether it can maintain that strength thats the issue. 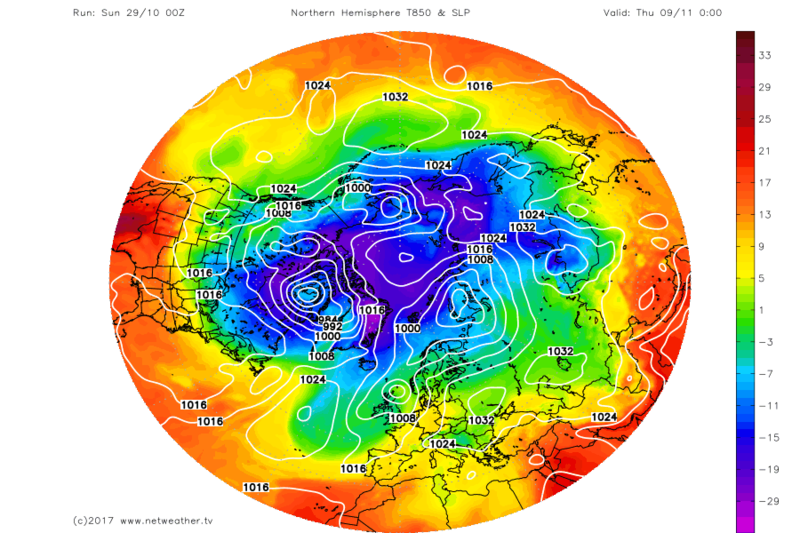 we've seen and will hopefully continue to see, warm air thrown up into the polar regions. a bit of 'zonal' now will help this process. 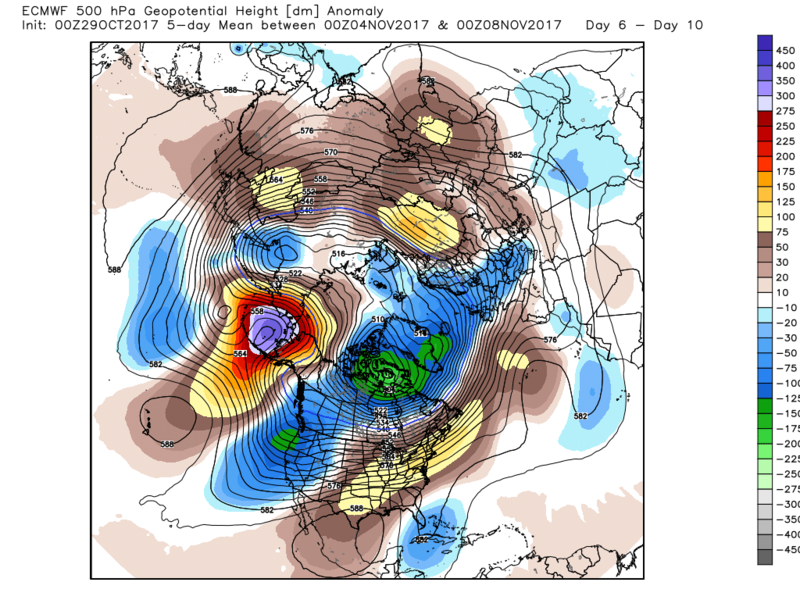 Can you blame some of us who enjoy wintry weather if we're seeing a largely zonal output consensus and aren't getting excited by it as it may lead to something better over the next few months? It's a very similar message to the one we were given last winter, but it never actually materialised. Have our first snowfall forecast amounts from the fine mesh model we use for our location . The period Sun 6pm -Mon 6am... 27cm at 1750 absl, heaviest during this period . Snowfall will become moderate to light during the rest of Monday, more showery with cloud breaking. By Monday morning , freezing level will be at 750m. 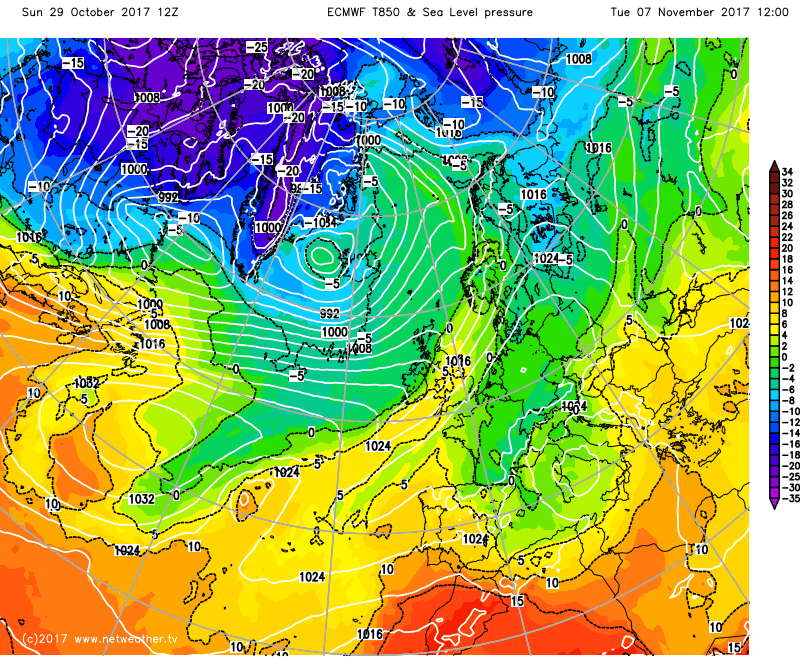 So looks like piste team will soon get to start on important base preparation with longer term lower temps expected as well which will help the process. 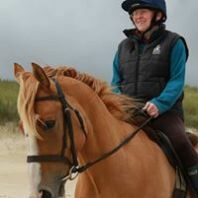 Getting excited ! Right on time, snow arrived mid -afternoon and now settling in. Present temp-1c and -3c at 2000m.  Will be interesting to see how accurate the fine mesh model prediction 4 days out will be. Usually spot on with-in a 3 sq Km range. Blows me away. Looking through the 12Zs, it's very, very average - a flattish northerly jet meaning we stay away from any particularly stormy weather, but no real hot/cold extremes. 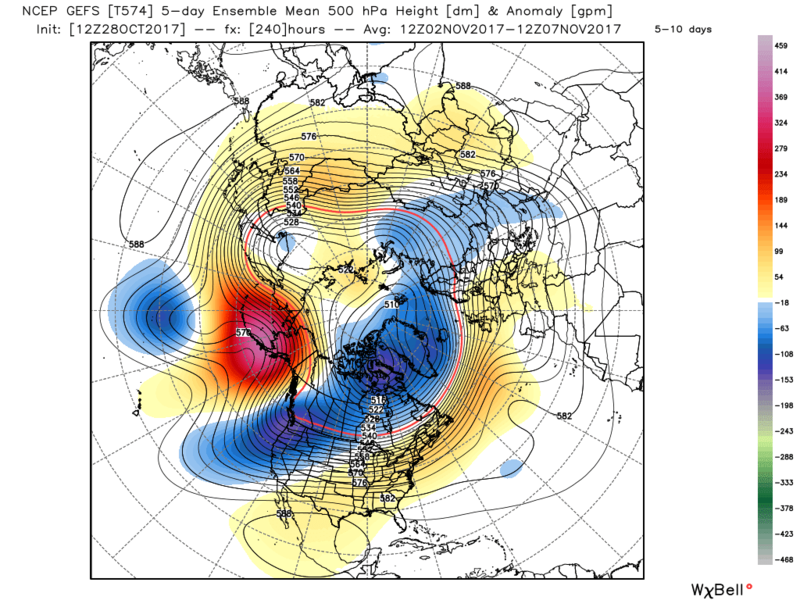 Checking out the ensembles, every chance this could be the story of the first half of November. However, I doubt temperatures will be average. Even in a northerly based flow today, it still felt pretty hot in the sun today down here. Plenty of days potentially well into the teens for the southern half as we go into November and, though that's hard to believe given recent autumns, that is still coming in on the very mild side. A mean westerly flow setting up with the air from mid-Atlantic bringing temperatures closer to normal by week 2 with perhaps the odd colder day in the far north.Not a very active jet though at the moment and with the increasing influence of the Azores high with time conditions looking fairly benign for many away from the north west. 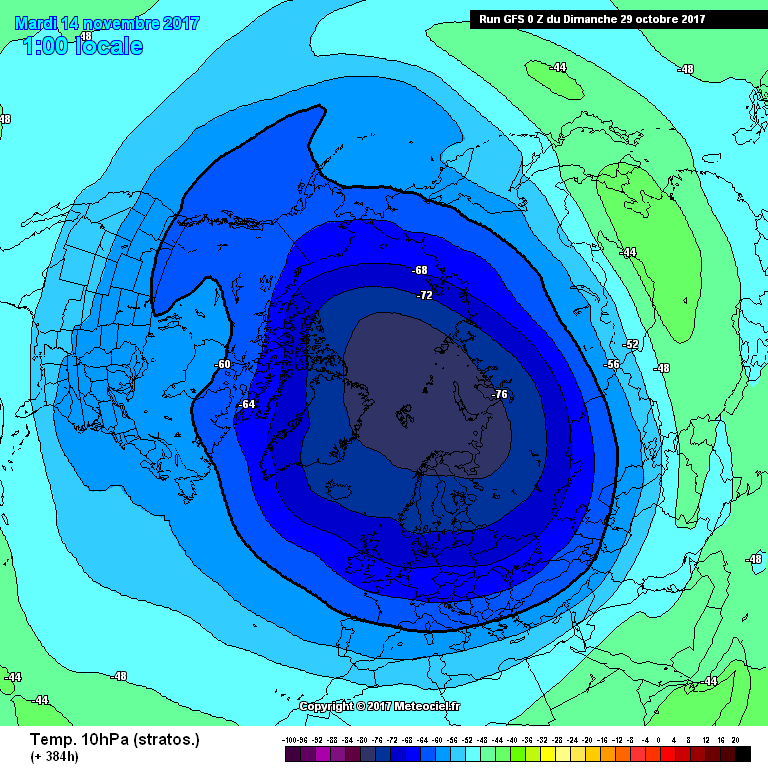 So a fairly unremarkable start to November is on the cards,based on current charts and ens.outputs. Edited October 29, 2017 by phil nw. it still felt pretty hot in the sun today down here. mild, sure. very mild, I suppose. Hot? no. 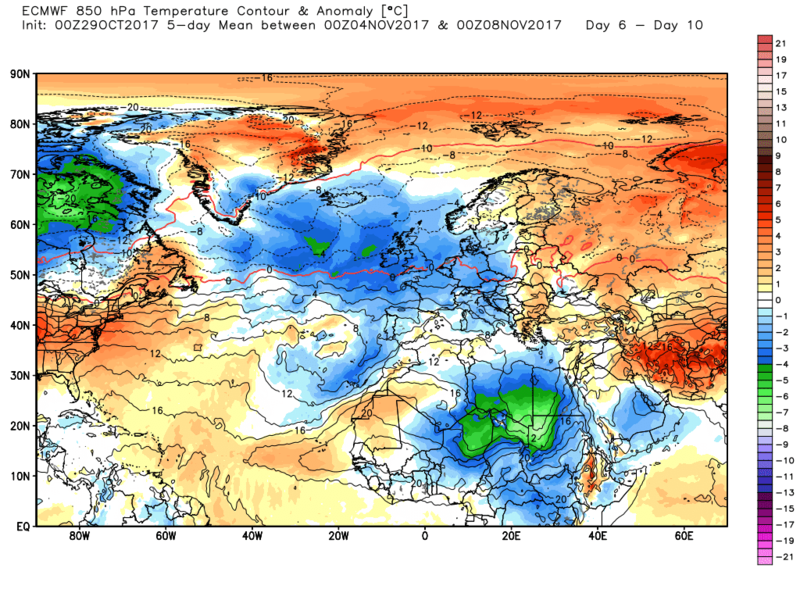 Nothing in last night's anomalies would suggest anything other than changeable/unsettled weather in the 5-14 day period with temps dipping a tad below normal quite likely. 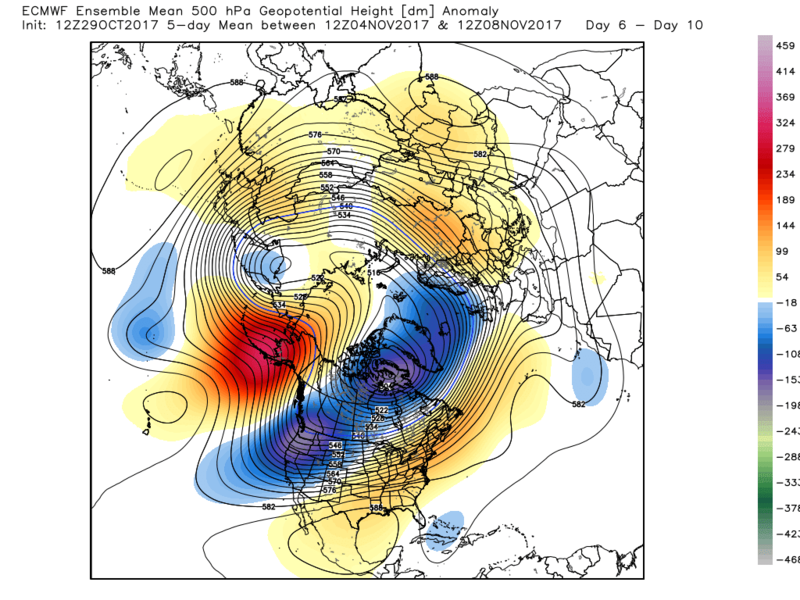 The overall pattern remains the same as previous with an Aleutian ridge, A lively vortex lobe N. Canada with associated positively tilted trough down N. America and, importantly as far as are are concerned, another low pressure area east/ south east over Greenland/Iceland. 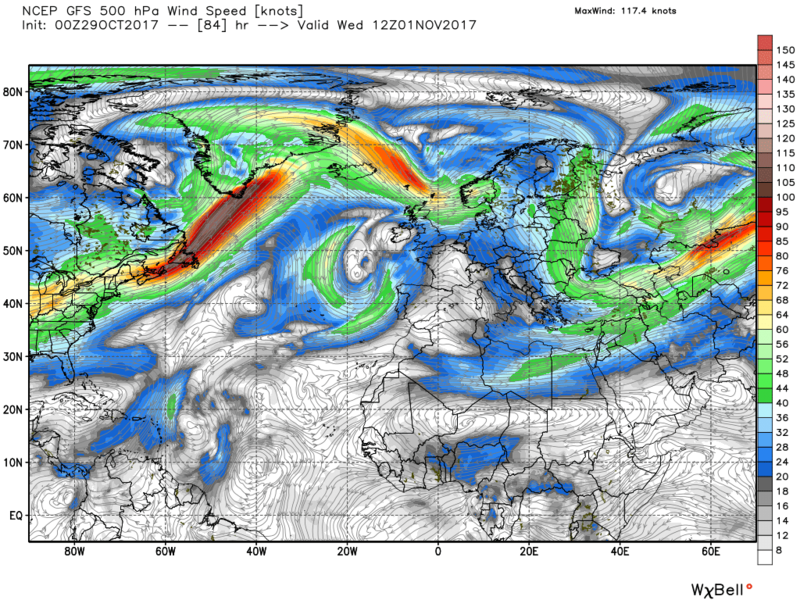 Thus a strong westerly upper flow across the US and the Atlantic,possibly alleviated to some extent in the east as the trough to the south west may have some influence in the south. Of course as ever the detain will need to be sorted by the det. runs and this surely will not preclude a the odd wintry spell as systems track east, particularly in the north. 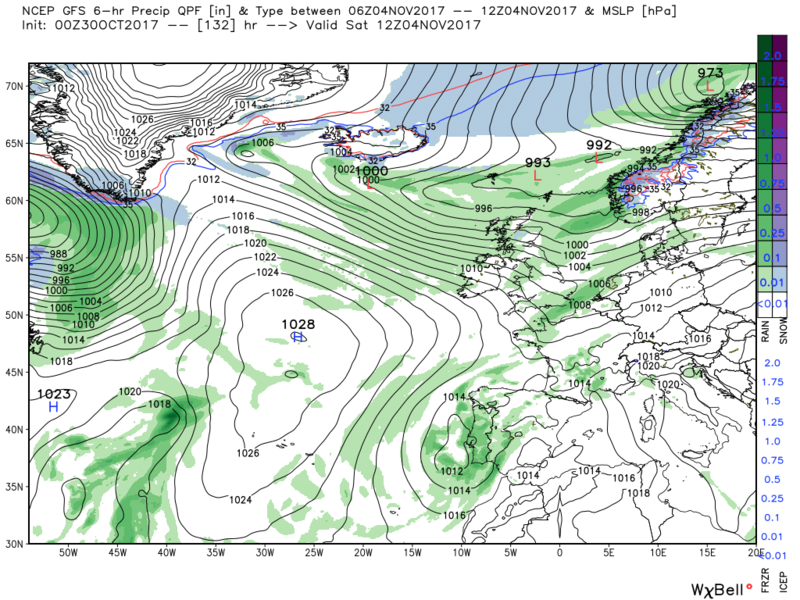 By midday Thursday the major trough to the north has slipped south east into the Baltic States leaving the UK in a ridge of high pressure sandwiched between the troughs to the north west tracking east and the cut off low to our south west with the strong thermal gradient running between Iceland and Scotland. 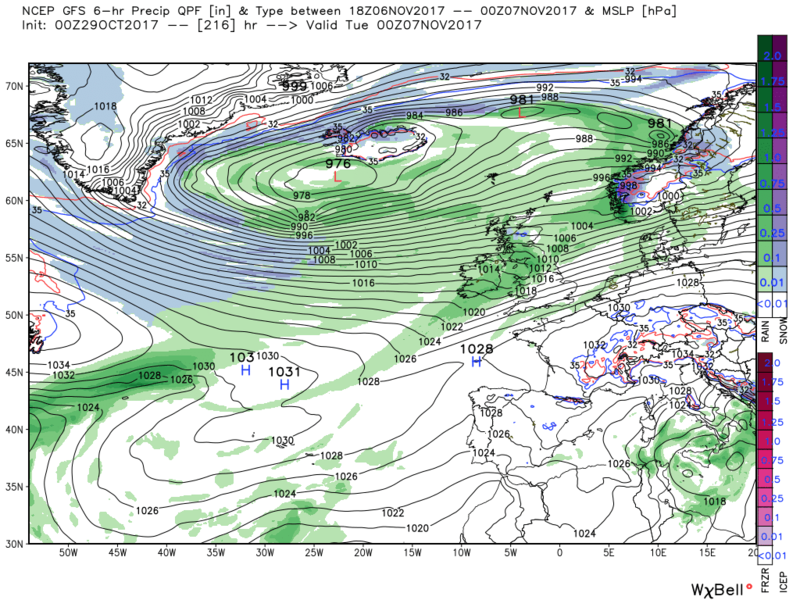 But over the next 48 hours, as the trough to the NW tracks east to be north east of Scotland the ridge is forced to retreat south west as weak fronts cross the country south east in the ensuing north westerly flow. 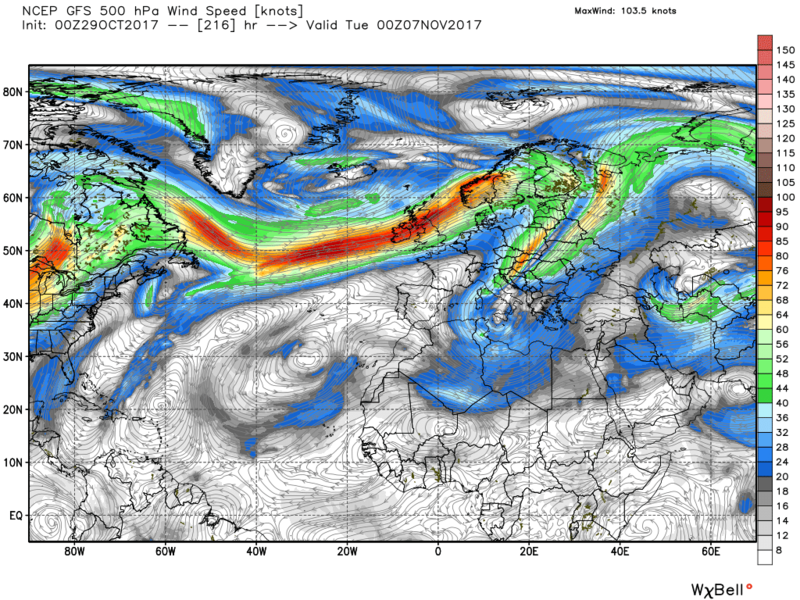 The trough continues on it's journey east and the surface wind veers northerly over the UK as a transient ridge moves in from the west over Sunday.Monday (giving ideal conditions for bonfire night) before a deep low tracks just south of Iceland 968mb with it's associated fronts already impacting N. Ireland and Scotland bringing rain and gales for many areas. 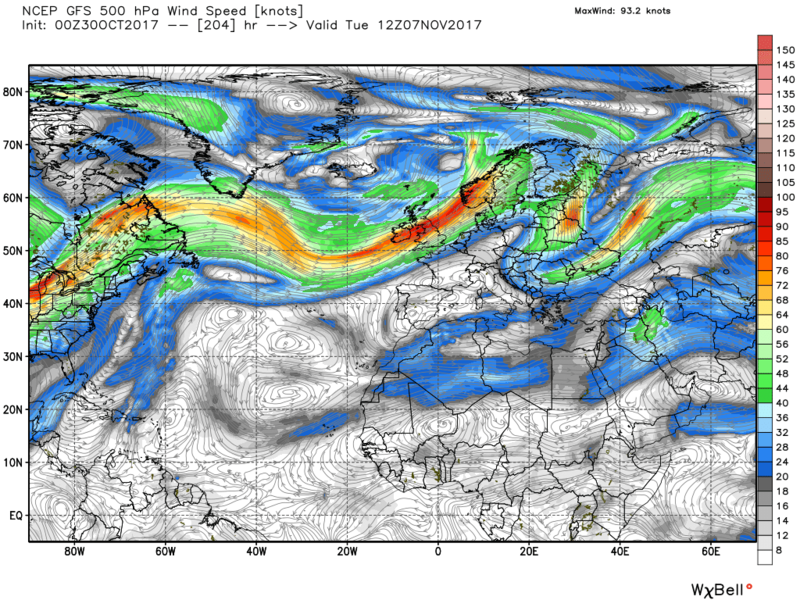 And with the jet pushed further south an example of Pm air sweeping across the country perhaps bringing the a spell of the aforementioned quite wintry conditions. 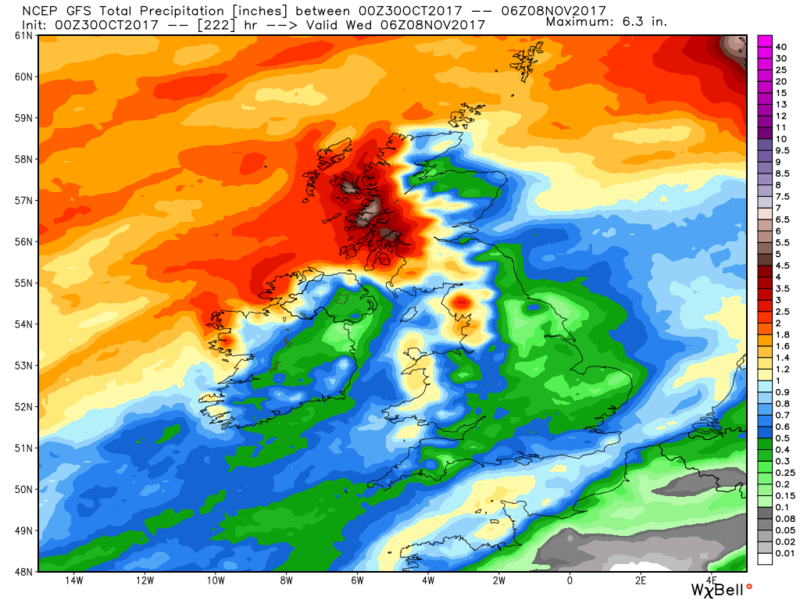 Best left there but again it's worth noting that much of the UK remains very dry throughout this period the exception again being western Scotland and parts of NW England. 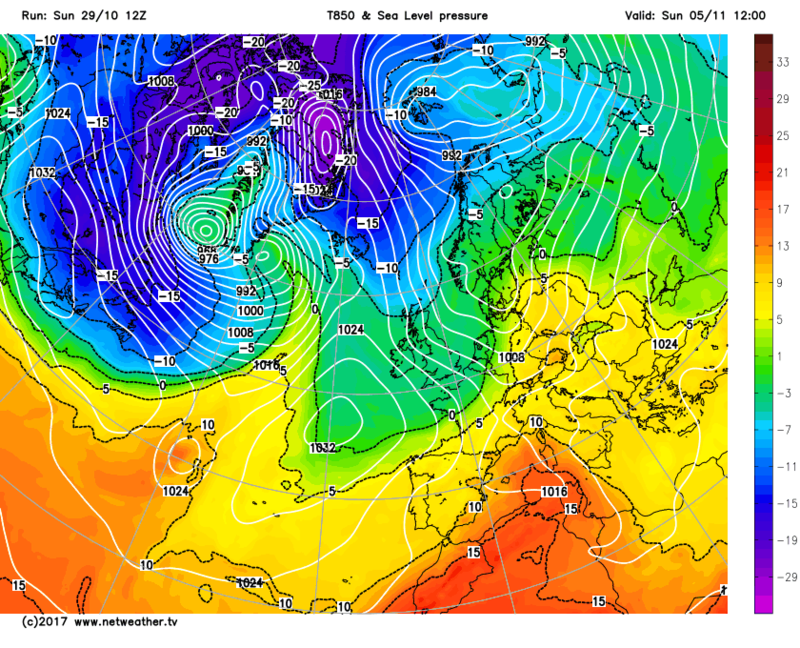 The 0zlooks more NW ly to me than SWly. Certainly not mild for this time of year. 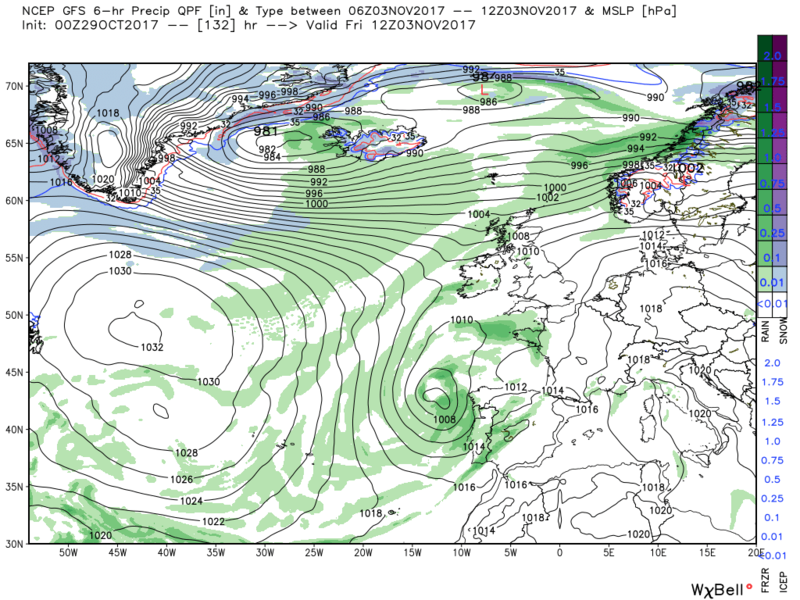 Not convinced it will be a mild Nov with the azores high constantly ridging either towards us or northwards in the atlantic. 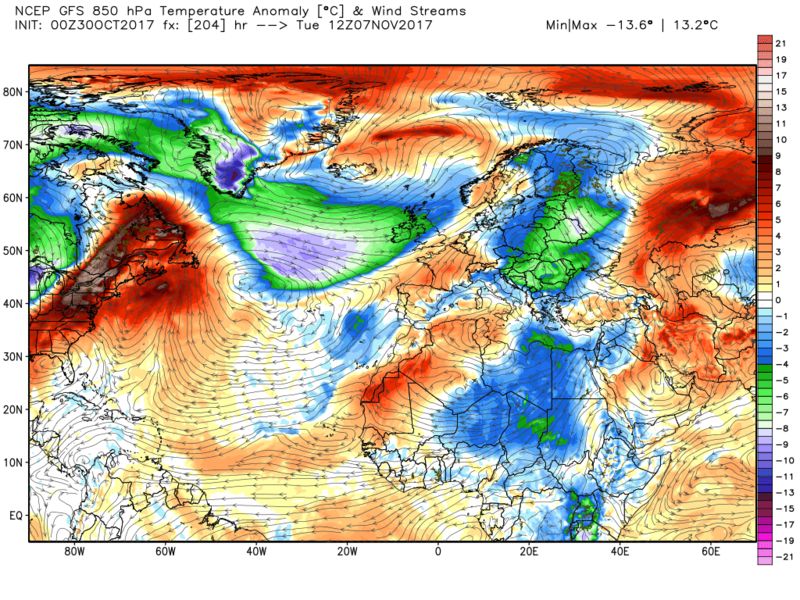 Its pushing the jetstream up and then down picking up cooler temps. 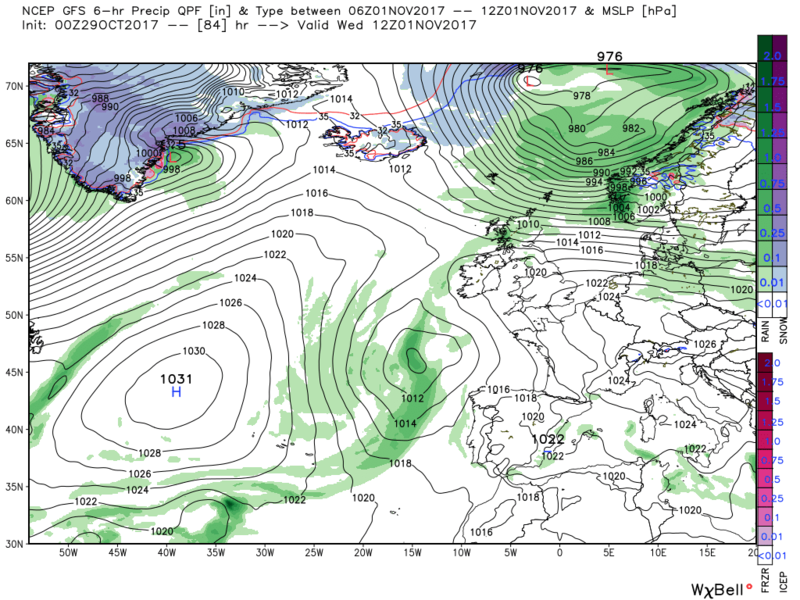 I know its a long way out but look at the low pressure over iceland would suggest a positive NAO but its taking in much colder air from Greenland and Canada hence dragging cooler NWly flow towards uk.